So the iPhone 5 is coming out. Its LTE data speeds mean you'll stand a much better chance of blowing past your data caps, which in turn means those grandfathered Verizon and AT&T unlimited data plans are more precious than ever. Here's how to make sure you don't lose yours. One note before you run off and pre-order tomorrow: Don't. AT&T and Verizon are both notorious for having opaque online tools for carrying over grandfathered plans. That's a bad thing, since if you accidentally ditch your plan, you probably won't get it back. Reps at both stores said that you've really got to be careful, since recovering your unlimited plan is pretty much a lost cause—not totally impossible, just effectively so. The real benefit of in-store is being able to stop and ask, "Now, you're sure this isn't going to mess with my unlimited plan, right?" You're just sort of left to your own devices online. Adding anything to your plan, like sharing bandwidth between devices or hotspot capability, will void your unlimited and dump you into a shared, tired plan. So don't splurge on, say, sharing your new iPhone's plan with your tablet's, since that will stick you in a new, limited package. Sorry, you're stuck with the basic data plan if you want to keep unlimited. The good part, for now at least, is that the bump up to LTE does not trigger this. AT&T is in a strange place right now: Like Verizon, it's trying to push its users into shared data plans. You can sign a new "unlimited" contract, but AT&T's now throttling its unlimited customers after 5GB—seemingly down from the old estimated soft caps around 6GB. I spoke with AT&T store representatives, who explained the process for porting over your iPhone along with an unlimited plan has always been kind of a hassle. The stores just sort of figure it out with trial and error. None of them had seen how the system handles the iPhone 5, but they figured it wouldn't be a problem to port those plans over. So we were told a few weeks after the iPhone 5 comes out, dropping by an AT&T store should be all you need to do to keep your plan. 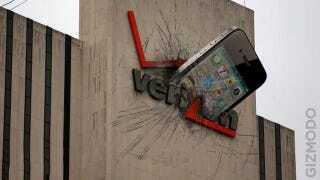 Verizon, on the other hand, voids your unlimited plan the second you sign a new contract. But! You're free to keep the plan if you buy your own phone. That means you can't get a subsidized phone, making the cost of an iPhone 5 with an unlimited data plan a little more complicated to sort out. The iPhone 5 will cost the same as the iPhone 4S did. So instead of a $200 iPhone, you're looking at $650 for a 16GB model, and $750 for a 32GB, which is probably the storage sweet spot for most people. The gap between all models' subsidized price and retail are the same—$450—and that averages out to $18.75 a month over a two-year plan. On top of your $30 unlimited plan, that means you're paying $48.75, or basically the same as a $50 5GB plan. If you go over 5GB regularly—and a bunch of you do—then it's probably worth the hassle of buying the phone out of pocket if you can afford it. If not, maybe it's time to put the old girl to bed and cosy up with a shared, tiered plan. They're the future, after all. You lucky bastards don't have anything to worry about. Other than being on Sprint.